Wow! That is really stunning! That’s just damn beautiful no matter which way you look at it. Wow!! Super photo! I like everything about it. 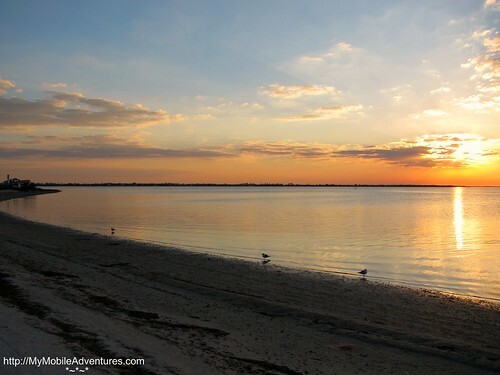 As always, you have captured the natural beauty of Sanibel so well. I love it all, the composition, the colors, the reflection. It is the kind of picture that makes you wish you could be there. Wow! What a shot. This would be a perfect Skywatch Friday post, too! What a stunning scene! Mesmerizing! That is beautiful. We have yet to make it out to the causeway for sunset this year. I need to put that on my “need to do” list before we head back north. What a great shot! Absolutely beautiful! So peaceful and tranquil. Love it. Nice sunset at a serene place. OMG…I heart this photo so much! Wow! I need a holiday! This is awesome! What an awesome shot! It must have been a very peaceful and serene evening.